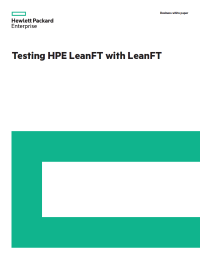 This document will present the LeanFT test results—along with lessons learned, tips, and advice for maximizing the automated testing capabilities of HPE LeanFT in your test environment. HPE designed its Lean Functional Testing (LeanFT) solution specifically for the new world of continuous testing and continuous integration tools. Our aim was to increase not only the efficiency of individual testers and teams, but also the level of coordination and cooperation between teams, and we did this by providing integration on multiple levels: supporting the most common AUT technologies, integrating with standard IDEs, leveraging HPE Unified Functional Testing (UFT) capabilities, and more. The question is, does HPE LeanFT work well enough that our own Agile and DevOps teams can use it to perform faster, better, more complete continuous testing of LeanFT itself? Can this lightweight continuous testing solution truly help HPE teams collaborate to accelerate test automation design and maintenance? Does it really integrate well with other functional testing processes, tools, and technologies, such as HPE Unified Functional Testing (UFT)?